Success at the very highest level, both former European champions, both winners of the Men’s World Cup but if two players are in need confidence boosting performances at the forthcoming Seamaster 2018 ITTF World Tour, Asarel Bulgaria Open in Panagyurishte; it is Dima and Vladi. Dimitrij Ovtcharov is the top seed in the Men’s Singles event, Vladimir Samsonov is the no.10 seed, overall the event starts with a two day qualification tournament on Tuesday 14th August followed by the competition proper on Thursday 16th August. Plagued by injury, very much in a rehabilitation phase, Dimitrij Ovtcharov is seeking a return to the form which saw him reserve the top step of the podium one year ago in Panagyurishte. In three appearances to date on this year’s Seamaster ITTF World Tour, Dimitrij Ovtcharov has yet to progress beyond the second round of a Men’s Singles event. Somewhat differently for Vladimir Samsonov, from an earlier generation, he must look further back in time. He is in search of the standards he set in the late 1990s when he rose the top spot on the World Rankings. In two ITTF World Tour excursions this year, he has yet to advance beyond the second round. Not impossible, three tournaments remain – Czech Republic, Sweden, Austria – but one of the 16 places in the Grand Finals at the end of the year looks bleak; presently on the Men’s Singles Standings, Dimitrij Ovtcharov is at no.35, Vladimir Samsonov at no.80. However, for three further notable names on duty in Bulgaria, the possibilities are bright. 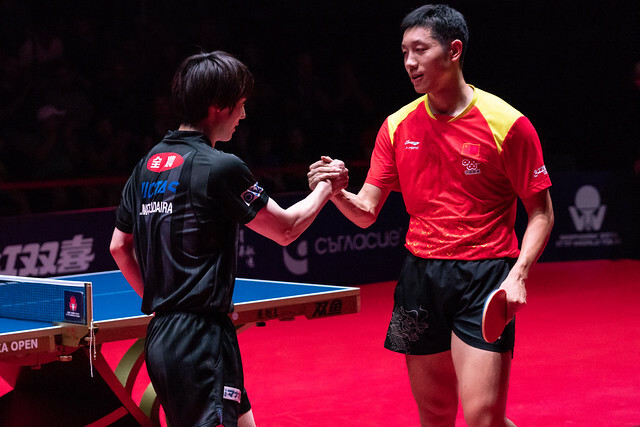 China’s Xu Xin and Ma Long are the respective second and third seeds; they are followed immediately by Japan’s irrepressible Tomokazu Harimoto. Xu Xin and Tomokazu Harimoto have both met the five appearance criteria for the end of year extravaganza; Ma Long, by competing in Bulgaria, will be one short. However, his name appears on the immediately ensuing Seamaster 2018 ITTF World Tour Czech Open, so by the end of August he will have reached the required number. Currently on the ITTF World Tour Men’s Singles Standings, Xu Xin tops the list; Ma Long is at no.3, Tomokazu Harimoto one place lower. Meanwhile, for the remaining leading names on duty in Panagyurishte, their chances of qualification could well hinge on their efforts in the southern Bulgarian town. Japan’s Kenta Matsudaira, the runner up in both 2015 and 2017 is below the line, as is colleague Koki Niwa. It is the same situation for Chinese Taipei’s Chuang Chih-Yuan, Denmark’s Jonathan Groth and the former Mattias Karlsson, now competing under his new name, Mattias Falck. Good performances, in fact outstanding performances are needed to reserve Grand Finals Men’s Singles places; however in the Men’s Doubles event, there are three pairs on duty who are well on course for one of the eight available places. Japan’s Masataka Morizono and Yuya Oshima, the reigning Grand Finals champions, currently at no.5 on the Standings occupy the top seeded spot; ominously one place higher on the list but the no.2 seeds in Bulgaria is the partnership formed by China’s Ma Long and Xu Xin. They have only competed as a partnership on two occasions this year but they appear on the Czech Republic entry list; thus they will meet the four appearance criteria. Prominent pairs but if there is one pair that has come to prominence this year it is that of Chinese Taipei’s Liao Cheng-Ting and Lin Yun-Ju. The no.5 seeds in Panagyurishte, they are listed at no.8 on the Standings. Now they have met the minimum appearance criteria, Bulgaria will be their ninth destination; they have appeared in every Seamaster ITTF World Tour tournament held this year!